It was announced that singer Dua Lipa was tapped to do an original song for the upcoming Alita: Battle Angel film from producer James Cameron and director Robert Rodriguez. The new song, “Swan Song,” is now available for listening, and the new track is an uplifting song about learning to fight for what you believe in. It’s written by Dua Lipa, Justin Tranter, Kennedi Lykken, Mattias Larsson, Robin Fredriksson & Junkie XL. In the music video, Alita: Battle Angel’s Iron City scrapyard is heavily featured, with the people salvaging for scraps and looking depressed. Robots are then sent to keep the people in check, thanks to the floating city of Tiphares. Dua feels helpless, but she looks into a mirror and sees Alita as her reflection, discovering that she’s also a cyborg. She prepares to fight and embraces her inner self as she stares up at Tiphares, feeling determined to fight another day. Additionally, Fox has released a new clip from the film titled “Mirror Punch,” which definitely inspired the “Swan Song.” In it, we see Alita doing some self-reflecting and then practicing her martial arts in front of a mirror. With this scene alone, she proves to herself that she’s capable of being a formidable fighter. The film is directed by Robert Rodriguez (Sin City, Desperado) and produced by James Cameron (Avatar, Titanic) and Jon Landau (Avatar, Titanic). The film stars Rosa Salazar, Christoph Waltz, Jennifer Connelly, Mahershala Ali, Ed Skrein, Jackie Earle Haley and Keean Johnson. The music video is directed by Floria Sigismondi. Alita: Battle Angel is based on the manga by Yukito Kishiro. 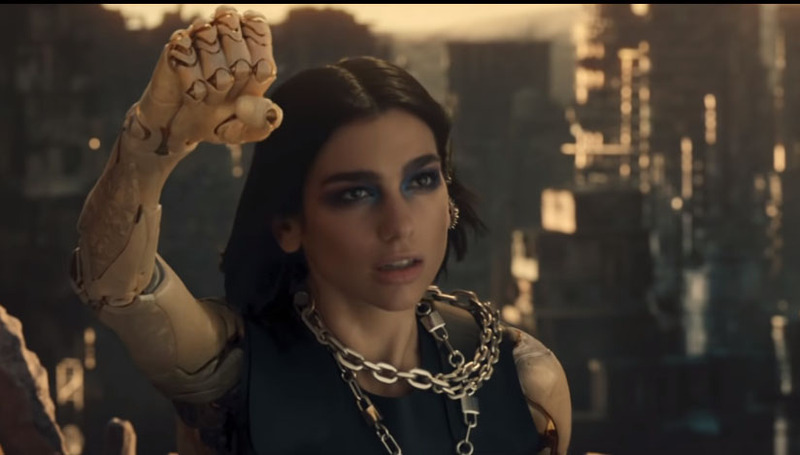 The post Watch Dua Lipa channel her inner Alita: Battle Angel with ‘Swan Song’ appeared first on Nerd Reactor.